This old, character, cob stone Cottage, believed to have been built around 1650, with original open beamed stone fireplace, is situated in the heart of the village of Kingskerswell. The property oozes much charm and character throughout. The property has been completely rewired in 2018 and also benefits from gas central heating in all rooms, with a new boiler fitted in 2016, and a brand new water tank for hot water system, fitted in 2018. The accommodation on the ground floor comprises lounge, inner hall and kitchen/diner. On the first floor, there are 2 bedrooms and a bathroom and WC. There is an attic space which has been doubly insulated, with flooring and a light. 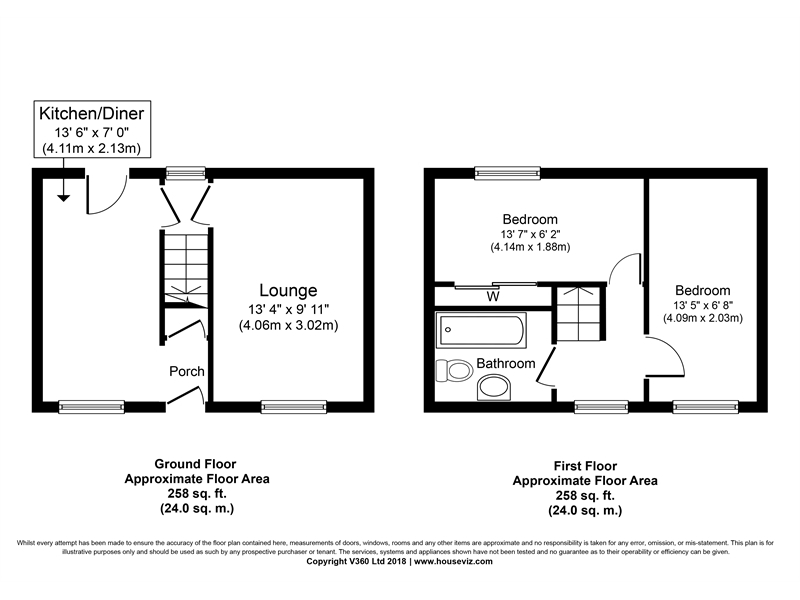 This area is ideal for storage or further accommodation if required, subject to the necessary planning consents. The property also has gardens to the front and rear and off road parking for one vehicle. Situated in the village of Kingskerswell, close to the school, health centre, pubs and the Church, together with frequent bus services serving Torbay and Newton Abbot, with its further range of facilities and amenities. Glazed door opening through to: Kitchen/Diner – 13’6” x 7’0” Inset single drainer sink unit with mixer tap. Fitted pine matching wall and base units. Worktop surface areas. Built-in 4 ring electric hob. Plumbing for automatic washing machine. Wall hung gas boiler for hot water and central heating system. Under stairs storage area. Tiled floor. Telephone point. Pine ceiling. Spotlight points. Window to rear aspect. Glazed door providing access to the rear garden. Glazed double doors opening through to: Inner Hall Staircase rising to the first floor. Radiator. Door opening through to the: Lounge – 13’4” x 9’ 11” Stone open fireplace. Single panelled radiator. Window overlooking the rear. Picture rail. Feature beam. Wall light points. TV point. First Floor Landing Single panelled radiator. Window to rear. Hatch to loft space, which could be a further attic room. Bedroom 1 - 13’5” x 6’8” Single panelled radiator. Window to rear aspect. Bedroom 2 – 13’7” x 6’2” Single panelled radiator. Built-in wardrobe. Window to front. Bathroom and WC Panelled bath with fitted shower. Inset wash-hand basin. Low level WC. Built-in airing cupboard housing tank with electric immersion. Fully tiled walls. Obscure single glazed window. OUTSIDE To the front of the property, is an enclosed area laid to patio with rockeries and an outside light. To the rear of the property, there is an area with a Summer House and off road parking for one vehicle.